Mega Man Legends 2, known in Japan as Rockman DASH 2 - Episode 2: Great Inheritance (ロックマンDASH 2 エピソード２ 大いなる遺産 Rokkuman Dasshu Tsū Episōdo Tsū Ooinaru Isan? ), is an action role-playing game released by Capcom in 2000, acting as a sequel to Mega Man Legends. It was released for the PlayStation in April 2000 in Japan, October 2000 in North America and August 2001 in Europe. Unchanged Japanese ports of the game were also released for the PC in July 2001 and for the PlayStation Portable in September 2005. The game features Mega Man Volnutt's quest to find four keys hidden in the planet in order to aid in the search of the Mother Lode, a legendary treasure thought to be an infinite energy source. A demo of the game was originally featured in the spin-off The Misadventures of Tron Bonne, with its purpose being to show an overview of the gameplay of the title despite having an independent story. 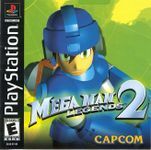 Critical reception to Mega Man Legends 2 has overall been positive with video game publications praising how the graphics and the gameplay improved over the ones from its prequel. Additionally, the game's story was praised for how complex it is in comparison to the ones from the original series. The gameplay from Mega Man Legends 2 is very similar to the one from its prequel and has a few changes. The player controls the protagonist Mega Man Volnutt in his explorations through ruins and fights against Reaverbots. The ruins, however, are from various islands in contrast to the prequel in which most ruins belonged to Kattelox Island. The player is able to travel to other islands with Roll's ship, the Flutter, although the he can only enter to certains islands by completing different missions. Unlike Mega Man Legends in which the player could enter to different ruins by having the approval of Kattelox's major, here the player must pass different tests in order to win Digger licenses from a specific level. The license allows Mega Man to enter into ruins which are forbidden to lower-class Diggers. Additionally, when winning a license, the Reaverbots' health is higher, but once they are destroyed, they drop more refractors' shards which are used in shops to buy items. Mega Man's interactions with other characters can also affect the character's state depending whether he is good with other people or makes them angry. Mega Man is also able to grab objects or people which help the player to complete missions. Mega Man can also suffer from special damage when fighting Reaverbots or touching fields that damage him such as lava. If the player equips Mega Man specific body part, he will become invulnerable to such states. Another addition is the underwater dungeon, in where the objects' weight is reduced and Mega Man can jump higher. The energy of the special weapons, which are developed by Roll using unusable items, are now shown in two energy bars, one green and one blue. The blue bar indicates how much energy the weapon has, while the green bar shows how much energy is consumed when the weapon is used.